Doug’s Cadillac in Washington state somehow managed to get their hands on a 2007 Cadillac CTS-V with only 108 miles on the odometer. Although I suspect time travel, I’ll let it slide for now. I must learn your secrets, Doug. Before the Chevy SS briefly appeared in our universe, the CTS-V was the car to get if you needed a very fast and very big LS-powered sedan. Some geniuses over at Cadillac decided to put a Corvette V8 in a car that would normally only see the parking lot of a church or law firm. First generation CTS-Vs made slightly north of 400-horsepower which was ridiculous for 10 years ago. For $42,880, you can have a brand new CTS-V from a decade ago. While it may seem disrespectful to immediately start hooning the Caddy when you buy it, think of it as using it for its intended purpose. It would be a great weekend-only thrashing car. The miles stay low and you get to drive a Corvette powered boat everywhere. What do you think? 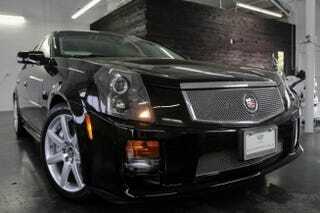 Is a practically new 2007 CTS-V worth $42,880. Would you thrash it the second you bought it? At $3,000, Will This Fly-Yellow 1990 Chevy Corvette Fly to a New Owner?